Staying within the scope of epic Hellenic black metal, Kawir deliver a number of compositions for which epithets like sweeping, ancient, anthemic and heroic are applied perfectly. The songs last good 7-8 minutes on average, take their time to unfold, and just roll over a full powerful percussion set while using rather clean quality production. 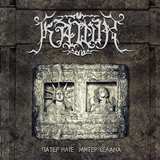 In accord with their apparent earlier trademark Kawir also weave in native wind instruments which never sound gimmicky or contrived. Sure enough, Kawir stretch their songs by repeating individual riffs and full portions but when riffs are as rousing as in To the Sovereign Sun or To Dioscuri, leading straight to romanticized battles, I'm not going argue. Instead, let’s hear more of those, and Kawir don't disappoint on Dionysus or Hercules Enraged, with compositions however taking on different personalities. Hercules Enraged still projects potency and might (title demands so), but Dionysus goes from countryside serenity to open bacchanalia (title expectations still fulfilled). Prodded on by cerebral double bass (To Mother Moon, Dionysus) or something which sounds like a bagpipe (Hail to the Three Shaped Goddess), Kawir's vocals, sung mostly in Greek I understand, shift from individual passionate exaltations a to monk brotherhood chants, but whereas Rotting Christ sound much more symphonic and grandeur Kawir manage to remain earthy and grounded. Garnishing the songs with cymbal sounds akin to sword clanks (To Dioscuri) or penetrating whirring melody (Hail to the Three Shaped Goddess) creates effective individualizing touches. There might be criticisms that dreamy and hypnotic To Mother Moon is stretched a little too long and The Taurian Artemis is not as rousing as the first 4 tracks on the album. Also, Father Sun Mother Moon closes with a 17' choral chant The Descent of Persephone where guitars are muddiest and percussion is an occasional tom hit. This will take an adjustment to fully accept. Kawir obviously planned it this way and will stand behind every note, clean or otherwise, and they should be very proud of their overall monumental work which is how Father Sun Mother Moon comes across.